After reading Jayne Ann Krentz' Secret Sisters, I wondered why it had been so long since I've read one of her books. She's a master at romantic suspense. This book is a page-turner, one that keeps the reader guessing until the very end with its twists and turns. When Madeline Chase and her best friend, Daphne Knight, were twelve years old, a sexual predator targeted them, picking the smaller of the two as his victim. It was a night that scarred both girls for life. Eighteen years later, Madeline returns to the scene, the deteriorating Aurora Point Hotel on Cooper Island in Washington. Her grandmother had owned the hotel, but when Madeline, her grandmother, and Daphne and her mother fled that horrific night, the property was left in the hands of a caretaker. Now, Madeline's grandmother is dead, and the caretaker has called, saying he failed in his duty to keep their secrets safe. When Madeline finds the dying man, struck down by an attacker, she knows she's the next target. She calls Jack Rayner, the head of Rayner Risk Management, the security team for Madeline's inherited string of boutique hotels. It doesn't take Jack long to determine that Daphne might also be in danger. The two women, who hadn't seen each other since they escaped eighteen years earlier, are now reunited. And, someone knows the secrets Madeline's grandmother tried to hide all those years ago. Jack Rayner is a professional, and he soon discovers someone on Cooper Island has an interest in keeping those secrets hidden. And, there are a number of secrets a powerful family might want to keep buried. As he and his brother, a computer genius, work to protect the two women, they uncover the truth, and the evil, behind a facade. Krentz' latest novel introduces characters who are strong because of their weaknesses. Madeline and Jack, along with Daphne and Abe, are likable, ordinary people, caught in a dangerous game. There's enough tension to keep any reader on the edge of their seat. Secret Sisters is a book to recommend to anyone who likes romantic suspense, with the emphasis on suspense. Fans of Heather Graham's Krewe of Hunters books will find this book appealing. If, like me, you haven't read one of Jayne Ann Krentz' books in a while, it might be time to go back and pick up this one. 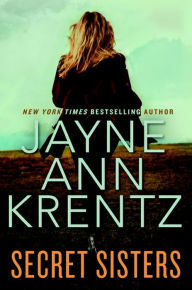 Secret Sisters by Jayne Ann Krentz. Berkley Books. 2015. ISBN 9780399174483 (hardcover), 342p. I knew this author's name was a little familiar. Years ago I read some of her Amanda Quick novels and liked them. Maybe it is time to try her again. I'm with you, Diane. It was years ago, actually over 11 years since I'd read one of her books. Good one. Most of the Amanda Quick books are set in the past (19th Century, mostly), the Krentz books in the present, and the Jayne Castles in the future, according to my wife, a very devoted fan. There is occasionally a crossover series using all three names and time periods. Just passing on info from the expect. Earlier in her career, Krentz wrote a number of smaller books as Stephanie James, and has written under several other names as well. My wife's current total of books read by her is 106 (! ), trailing only Nora Roberts (at 183!) and Diana Palmer. She does too, and loves the J. D. Robb books. She says a lot of the "black Irish" characters in Nora's trilogies remind her of Roarke in the Eve Dallas series. I have a review of J.D. Robb's new book coming up, but "someday" I need to go back and start at the beginning of that series.